ellehermansen: OPI Presents: Alice In Wonderland Nail Polish Colours! 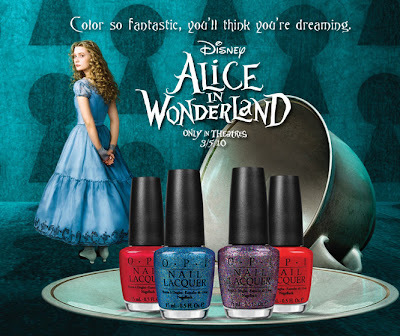 OPI Presents: Alice In Wonderland Nail Polish Colours! Yes! I am soooo excited to wear crazy, chunky sparkles again - like "Absolutely Alice" and "Mad as a Hatter" They also have a darker red called "Thanks So Muchness!" and a nice bright proper "Off with her Red!" Check it out and "Try it on" here. If you DO go to the website, you can enter a chance to win one of twenty-six prizes! I just spent entirely too long reading through a bunch of your blog posts that I missed! I adore OPI nailpolishes and Alice in Wonderland! I can't wait for the Tim Burton movie to come out this weekend. Your frames are beautiful! You did such a wonderful job! What a great idea! I want to start an etsy store when I get home. I am all over the place with packing I feel unsettled. Wow! Seriously your frames are perfect! I love! I will keep your store in mind though, I know a few who love Alice too so I will forward them your store too! Again, beautiful job and I hope we can see you sooner than later. So nice to hear from you, girl!